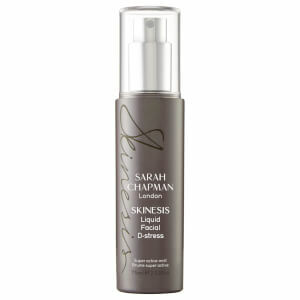 Treat tired, sensitive and dehydrated skin to the Sarah Chapman Skinesis Liquid Facial D-Stress; a lightweight micro mist infused with a host of active ingredients to support the natural defence barrier. Fortified with Smartsome™ X50 targeted peptide, the refreshing formula targets visible lines and wrinkles, whilst antioxidant Glycofilm® and Venuceane™ defend against pollution and environmental aggressors. Calming, soothing and ultra-hydrating, the liquid is ideal for travelling and quenching thirsty skin on-the-go. Expect a smooth, glowing complexion with a plump, youthful-looking appearance. Can be applied under or over makeup. Close your eyes and spray onto the face under or over makeup, re-apply as required. If discomfort occurs, rinse with warm water. Alternatively spray onto cotton pads and sweep over skin after cleansing. Keep in your bag for a quick restoring spritz any time of day. 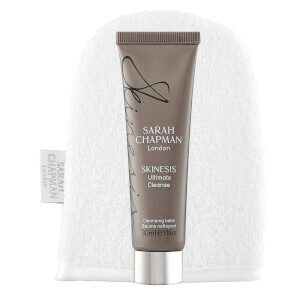 Ideal for travelling and quenching thirsty, dry, dehydrated skin or calming hot flushing sensitive complexions. Aqua (Water), Pentylene Glycol, Polysorbate 20, Phenoxyethanol, Thermos Thermophilus Ferment, Butylene Glycol, Ribose, Sodium Pca, Decylene Glycol, Panthenol, Cedrus Atlantica Bark Oil, Parfum (Fragrance), 1,2-Hexanediol, Dipotassium Glycyrrhizate, Glycerin, Jasminum Officinale (Jasmine) Flower Extract, Pelargonium Graveolens Flower Oil, Santalum Spicata Wood Oil, Bisaccharide Gum-2, Biosaccharide Gum-4, Phenylethyl Alcohol, Phytol, Rosa Damascene Flower Oil, Citric Acid, Ahnfeltia Concinna Extract, Caprylyl Glycol, Methyl Eugenol, Alcohol, Alpha-Cedrene, Geranyl Acetate, Indole, Longifolene, Tetramethyl-1-Hexadecan-3-Ol, Biosaccharide Gum-1, Chlorphenesin, Hexacarboxymethyl Dipeptide-12, Propylene Glycol, Acetyl Tetrapeptide-40, Acetyl Hexapeptide-37, Acetyl Hexapeptide-49, Sodium Dehydroacetate, Lactic Acid/Glycolic Acid Copolymer, Palmitoyl Tetrapeptide-50, Polyvinyl Alcohol, Heptapeptide-15 Palmitate, Potassium Sorbate, Benzyl Cinnamate, Citral, Eugenol, Farnesol, Hydroxycitronellal, Nerol, Anise Alcohol, Benzyl Salicylate, Cinnamal, Cinnamyl Alcohol, Coumarin, Isoeugenol, Limonene, Benzyl Alcohol, Benzyl Acetate, Benzyl Benzoate, Citronellol, Geraniol, Linalool.